Easter is a time for eggs and chocolates. We will draw a cute Easter card here. 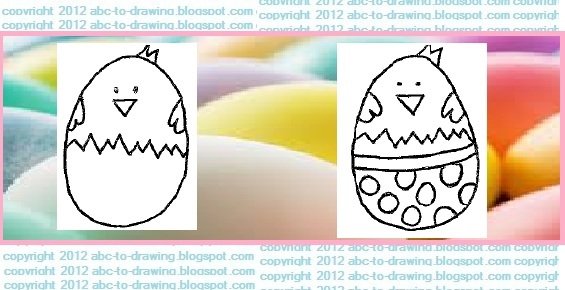 It is a little Easter Chicken Card. Write a series of W in the middle of this egg. Put two dots for eyes and join ends of I with V.
Make wings by writing lower case W on each side. Make hair by writing M on top of egg. Decorate egg with lots of dots. Color and our cute chick in the egg is ready. Hope you will like this cute Easter Card. Lets end with another Easter joke. How did the littel chicken do inside in the egg?